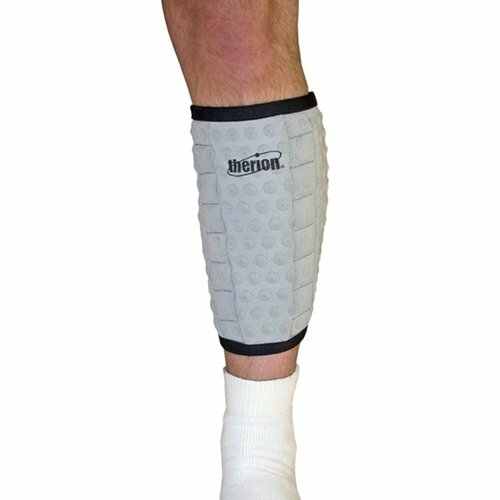 Therion Magnetics Platinum Magnetic Calf Support by Healiohealth at Get Cheap Health Insurance. MPN: OS253. Hurry! Limited time offer. Offer valid only while supplies last. Magnet Therapy for Calf Pain Relief combine 12,800 gauss neodymium and 12 research grade biomagnets at precise angles for Maximum Field Integration. Magnet Therapy for Calf Pain Relief combine 12,800 gauss neodymium and 12 research grade biomagnets at precise angles for Maximum Field Integration. This new engineering method developed by Therion provides the highest degree of effectiveness possible in a magnetic calf support. Larger magnets (versus Magnetic Calf Support Sport) provide maximum stability and comfort to your ankles. Don't be limited by your calf pain. Use a magnet therapy calf support to help relieve calf pain. Magnetic Calf Support provides excellent lateral support to protect the medial and lateral ligaments. It retains the heat produced by the body in a specific area and hence aids in the healing process. Also it reduces the symptoms of calf pain and adds stability by applying gentle pressure to prevent additional tearing of the soft tissue away from the tibia bone.Patented Thermal Regulation System- Whether you're an athlete, a weekend warrior, or simply relaxing at home - This amazing "Smart Support" system provides unmatched comfort and support at any level of activity. By precisely controlling the movement of heat and perspiration, it dramatically increases wearability and user tolerance from only an hour or so, as with standard neoprene supports, to 24-hrs/day for an indefinite period for this support. This is one of the reasons this calf/shin sleeve is excellent for running calf cramps.RETURN POLICY:This Product has a 30-day money-back guarantee and Non-returnable items:-Items that have been laundered, modified, soiled, or damaged. If you have any questions about this product by Healiohealth, contact us by completing and submitting the form below. If you are looking for a specif part number, please include it with your message.